Emergency + was recommended to me by someone who actually needed to call 000 recently. 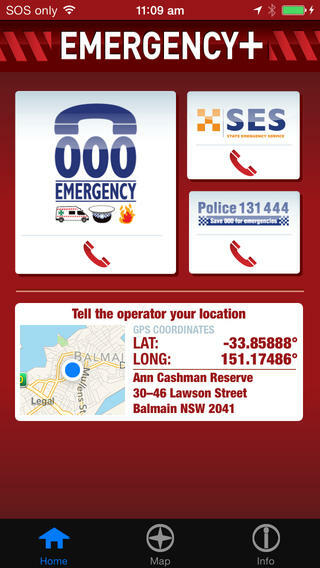 It’s the NSW emergency services app desigend to make it easy to call the appropriate number in an emergency. When you fire up the app for the first time you’re confronted with a long agreement – and more on that in a moment. Once you are in the app, it shows your current location and has a large button to press for 000. In some ways the most immediate use of the app is the alternate emergency services. The app explains when to use 000 and when to contact other services if the emergency is not so immediate. In a real emergency you can hit the button and the app will transfer you to the phone functions. You then have to have the presence of mind to know how to get back to the map to tell the operator where you are. And the fact that you have to do that manually is the major criticism of the app – a problem highlighted when you delve into that huge license agreement you said ‘yes’ to when first running the app. Almost everyone will, I’m sure, just press the ‘I agree’ button, but it was interesting to take a look at what it contained for the purposes of this review. Unsurprisingly, the app might not work and if so the NSW Government is liable for nothing. Apparently even using the GPS is an issue because “…the operator receiving an emergency call may transcribe the location coordinates incorrectly in which case the relevant emergency service will be sent to the wrong location”. This reveals the first problem with the app – why on earth doesn’t it send the location data and avoid transcription errors, that would be a clever use of the mobile phone for these purposes. The other licensing issue is that if you use the app you agree to waive every single right that a group of high-powered lawyers has determined that you might have against the NSW Government. If you just call from your home phone you don’t have to disclaim liability before you start. I don’t know. In a real, full-on emergency I think I’d be going to the phone application and directly dialing 000. If I saw something or needed something less urgent than I’d be far more inclined to fire up this app and look for alternatives to 000 and in that context it would be clever if this app included the numbers to call for electricity and water issues. The app is free and it doesn’t hurt to have it sitting there in case of need. It’s just a shame it hasn’t taken that extra steps to make it really useful. Perhaps if as much effort had gone into the app as went into that dastardly agreement, the results could have been different.